I have previously discussed the probability that many Jaredites dispersed outward from the main group of Jared's subjects in the land of Moron. This may have occurred early in their history, or little by little as individuals and groups dissented and rebelled against the central authority. As I have written elsewhere, it was likely that the original Jaredite families dispersed over the land following the arrival. This is what the Lord had originally expected and commanded them to do following the flood. If this occurred it would explain the other groups which populated Mesoamerica prior to the time of Christ. There is also the possibility that the Jaredite ships landed at different points along the coast from Mexico down to Nicaragua. This is hinted at in the Indian legends, but I have been unable to verify it from other sources. Some of the legends seem to indicate a scattered landing of the original people. While the main group of Jaredites continued to inhabit the land of Moron, and its surroundings throughout their 2000 year history, many other groups developed and flourished farther north in what is now Mexico and Guatemala. They co-existed in Central American with the Jaredites of Moron, and later survived the decline and destruction of Coriantumer's people in the land of Moron about 300 BC. Whether these outlying groups had contact with the main body of Jaredites is not revealed in the record, but in view of the history of trade among the various distinct groups, over large distances, it is likely that they did. Such trade is revealed in the archaeological record, as well as post-conquest histories. These outside groups probably descended from the original Jaredite stock, however, it is possible that other outside peoples were also allowed to enter into the promised land. Lehi hinted at the possibility of such other groups in the promised land when he commented: "The Lord hath covenanted this land unto me, and to my children forever, and also all those who should be led out of other countries by the hand of the Lord. Wherefore ... there shall none come into this land save they shall be brought by the hand of the Lord ... it is wisdom that this land should be kept as yet from the knowledge of other nations; for behold, many nations would overrun the land, that there would be no place for an inheritance (2 Ne. 1:6-8)." Although Lehi is here specifically referring to the Nephite people, this reference is also applicable to the Jaredites. In this article I would like to explore some of these other peoples. This study will not be inclusive as there were numerous groups and subgroups, but will focus on the principal cultures and civilizations. I would also like to point out that these peoples were probably more or less present throughout the history of Mesoamerica, but would prosper and decline periodically depending upon their individual development and population. Most of these "other Jaredites" existed as identifiable groups but their influence would wax and wane. When one group would achieve dominance, the others would still exist, often as subservient subjects to the major power. Later this or that group might excel and become the dominant power in the area, but the lessor factions were rarely completely exterminated. Let me give an example of this: when the Olmec civilization bloomed forth in about 1500 BC they did not suddenly appear out of a vacuum. Their progenitors had been present for generations, but at this point their culture coalesced into an advanced civilization. Similarly, when the Aztecs gained power in about 1300 AD they grew out of the roots of earlier peoples. The Book of Mormon mentions three groups that we know about that were allowed access into the Promised Land of the Americas - the Jaredites, who arrived about 2000 BC, the later Nephites and descendants of Lehi, who arrived about 590 BC, and the Mulekites. This later group arrived in Mesoamerica sometime between 570 and 550 BC. They apparently landed on the Atlantic side of the continent, probably at Panuco near Tampico, Mexico, where they were either adjacent to, or mixed with the local Jaredite groups. They may have been an ethnically mixed people which could have included Jews, Egyptians and Phoenicians. Archaeologically, the early Mesoamerican Jaredites could be labeled as the formative period cultures. During the history of this early period a number of groups separated and developed their own specialized cultures. Groups such as the Olmec, the Maya, the Zapotecs, the Huaztecs, and the Toltecs. Later a group migrated from the region of the Gulf of California. Originally known as the Chichimeca or Mejica, they developed into the powerful Aztec nation. All of these groups seem to have come from a common origin, although the scholars would probably disagree with this hypothesis. But they all had many cultural traits which they held in common, and these were similar to the cultural traits of the main body of Jaredites, as well as with the parent culture of Sumeria. These groups were often in conflict with one another, trying to dominate, and if possible, subjugate the other. Their individual political influence waxed and waned over the course of history. Most of them marshaled the economic, political, and military might to build magnificent cities and religious centers during their periods of dominance. They kept records and histories, they measured time, they understood astronomy, they perfected their languages and writing skills and they excelled in many of the arts. One problem with my theory of a common origin of the Mesoamerican people is that of language. There are a number of distinct languages present in this area which may or may not be related to one another. Such languages may indicate a separate ethnic origin, although there are common traits among the various languages of Mesoamerica. The earliest languages appear to have been Oto-mangean, Mixe-Zoquean and Mayan. 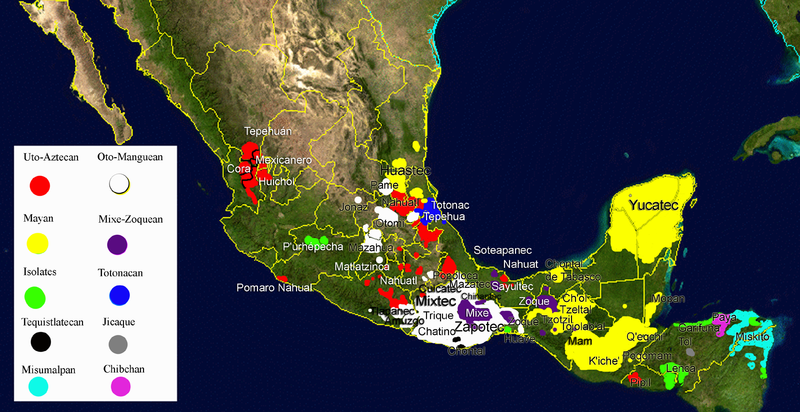 The accompanying map indicates the distribution of present day languages in Mesoamerica. This can give us some indication of the original homeland of each group, although there has, of course, been considerable migration over the centuries. In the following sections I will attempt to describe some of these individual groups. As Wikipedia, and other sources, do such a thorough job of conveying information on this subject, I will quote from these individual sources where appropriate. These groups occupied the Pacific coast of Mesoamerica, in what is know as the Soconusco region, from about 1900 to 1000 BC. There are three main groups which in many reports seem to be synonymous. They are the Mokaya, the Ocos, and the Barra phase peoples. These groups are all pre-Olmec and will be discussed separately below. The Mokaya was one of the earliest cultures identified by archaeologists. These people were located along the Pacific coast of Southern Mexico and Guatemala in the area known as the Soconusco. The people spoke a language now referred to as Mixe-Zoquean. The principal site was Paso de la Amada which flourished from 1800-1000 BC. Izapa is another major site in the area and may have been occupied as early as 1500 BC and flourished until 100 AD. From Wikipedia we read: The Mokaya were pre-Olmec cultures of the Soconusco region in Mexico and parts of the Pacific coast of western Guatemala, an archaeological culture that developed a number of Mesoamerica’s earliest-known sedentary settlements. The Soconusco region is generally divided by archaeologists into three adjacent zones along the coast—the Lower Río Naranjo region (along the Pacific coast of western Guatemala), Acapetahua, and Mazatán (both on the Pacific coast of modern-day Chiapas, Mexico). The term Mokaya was coined by archaeologists to mean "corn people" in an early form of the Mixe–Zoquean language, which the Mokaya supposedly spoke. The Mokaya are thought to have been among the first cultures in Mesoamerica to develop a hierarchical society, which arose in the Early Formative (or Preclassic) period of Mesoamerican chronology, at a time (late 2nd millennium BCE) slightly before similar traits were evident among the early Olmec centers of the Gulf Coast region. The Ocos was another of the earliest formative period cultures. It has been identified from the same area as the Mokaya (Pacific coast of Chiapas and Guatemala) and they may be overlapping cultures. It has been identified mainly through its ceramics which is the earliest dated pottery from Mesoamerica. In addition to pottery, these people also produced many figurines. This time period (1200 BC) shows evidence of the emergence of chiefdoms and other evidences of specialized social order. 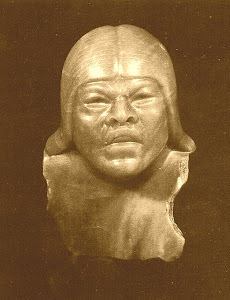 The Olmec apparently developed from some of the early formative peoples of Mesoamerica and although many of the formative sites exhibit "Olmec" traits and traditions, their later principal sites were located along the eastern gulf coast of Mexico. Olmec is a term that was bestowed upon them by the researchers but it was actually the name of a later distinct tribe of natives. The Olmec have been mainly defined by the style of art and artifacts found at their sites. They are often referred to as the "mother culture" of later Mesoamerican peoples. They possessed an early form of written language. 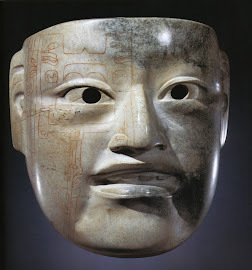 Their physical appearance can be seen in their many masks and busts which have been found in their abandon sites. The principal Olmec sites were San Lorenzo, La Venta, and Tres Zapotes. From Wikipedia we read: The Olmec were the first major civilization in Mexico. They lived in the tropical lowlands of south-central Mexico, in the modern-day states of Veracruz and Tabasco. The Olmec flourished during Mesoamica's Formative period dating roughly from as early as 1500 BCE to about 400 BCE. 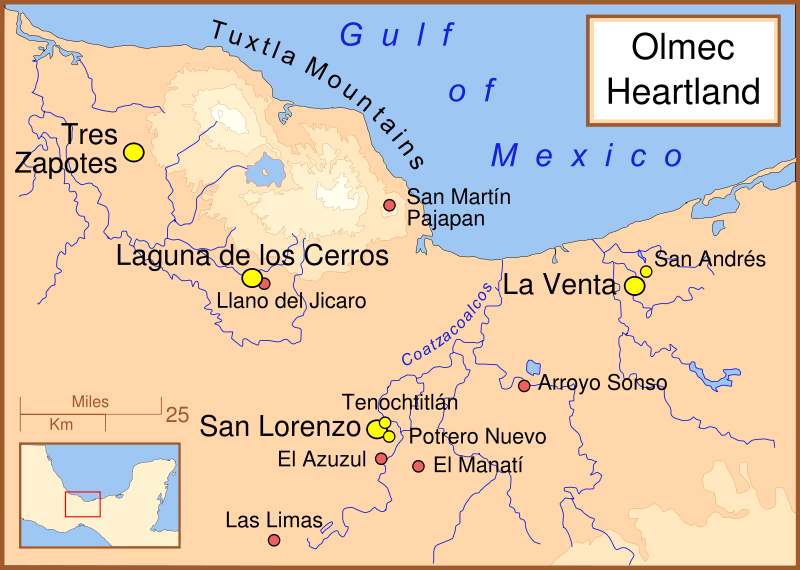 Pre-Olmec cultures had flourished in the area since about 2500 BCE but by 1600-1500 BCE Early Olmec culture had emerged centered around the San Lorenzo Tenochtitlan site near the coast in southeast Veracruz. They were the first Mesoamerican civilization and laid many of the foundations for the civilizations that followed ... The most familiar aspect of the Olmecs is their artwork ... The Olmec civilization was first defined through artifacts ... Olmec artworks are considered among ancient America's most striking. 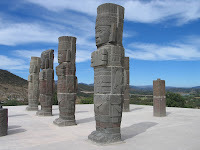 Following the decline of the Olmec civilization, the Zapotecs became dominant and flourished from about 500 BC to 700 AD in the Oaxaca Valley in southern Mexico. They spoke a form of the Oto-manguean language and developed one of the earliest forms of writing found in Mesoamerica. Their chief site was Monte Alban. From Wikipedia: The Zapotec civilization was an indigenous pre-Columbian civilization that flourished in the Valley of Oaxaca of southern Mesoamerica. Archaeological evidence shows that their culture goes back at least 2,500 years. They left archaeological evidence at the ancient city of Monte Alban in the form of buildings, ball courts, magnificent tombs and grave goods including finely worked gold jewelry. Monte Albán was one of the first major cities in Mesoamerica and the center of a Zapotec state that dominated much of what is now the Mexican state of Oaxaca. The Zapotec state formed at Monte Albán began an expansion during the late Monte Alban 1 phase (400–100 BC) and throughout the Monte Alban 2 phase (100 BC – AD 200). Zapotec rulers began to seize control over the provinces outside the valley of Oaxaca. They could do this during Monte Alban 1c (roughly 200 BC) to Monte Alban 2 (200 BC – AD 100) because none of the surrounding provinces could compete with the valley of Oaxaca both politically and militarily. By 200 AD the Zapotecs had extended their influence, from Quiotepec in the north to Ocelotepec and Chiltepec in the south. Monte Albán had become the largest city in the southern Mexican highland, and so it remained until approximately 700 AD. 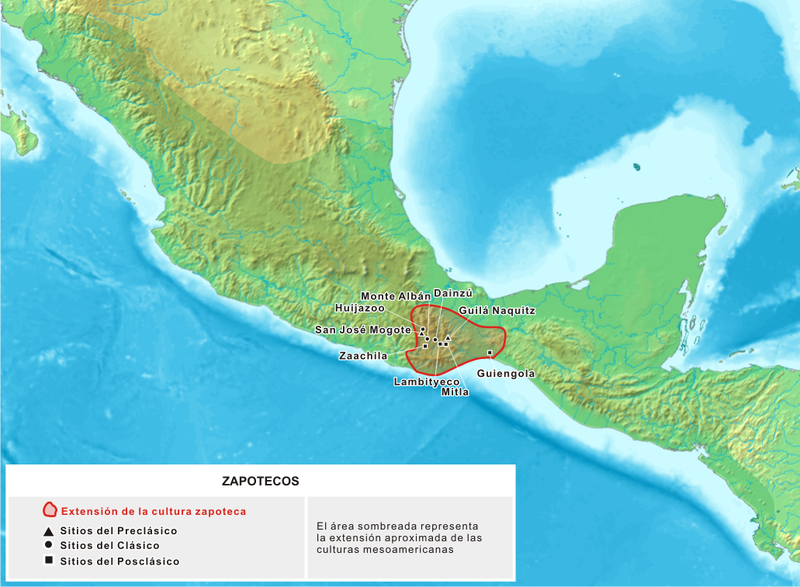 The name Zapotec is an exonym [a name given by outsiders] coming from Nahuatl tzapotēcah ..., which means "inhabitants of the place of sapote". The Zapotec referred to themselves by some variant of the term Be'ena'a, which means "The People". The Zapoteca spoke the Oto-manguean language. The Chichimeca apparently pre-dated the later Toltec culture. Mariano Veytia, in his book Ancient America Rediscoved, mentions that these people were the Lords of the Toltecs before they (the Toltecs) revolted, broke off, and established their own kingdom. They seem to have been an advanced people at one time, however all later references to them are of a savage, wild and uncivilized people, who foraged in the mountains for their food. In more historic times, they seem to have divided into a number of related groups, all having similar lifestyles. At the time of the conquest, they resided in the rural areas of central Mexico. 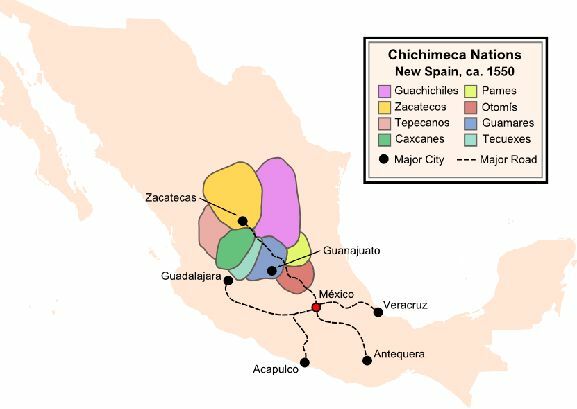 From Wikipedia we read: Chichimeca was the name that the Nahua peoples of Mexico applied to a wide range of semi-nomadic peoples who inhabited the north of modern day Mexico and the southwestern United States. The image of the Chichimecas as described by the early sources was typical of the era; the natives were "savages" - accomplished at war and hunting, but with no established society or morals, fighting even amongst themselves. The Toltec preceded the Aztec culture and was dominant in central Mexico for about 300 years. Their principal city was Tula, located a short distance north of present day Mexico City. The Toltecs may have been derived from a subgroup of the Chichimeca. After about 1000 AD the civilization declined and disappeared. The Toltec peoples may have become extinct, however, it is more likely that they became subservient and were absorbed into the surrounding cultures. They may have spoken the Nahuatl language. From Wikipedia: The Toltec culture is an archaeological Mesoamerican culture that dominated a state centered in Tula, Hidalgo, in the early post-classic period of Mesoamerican chronology (ca 800-1000 CE). The later Aztec culture saw the Toltecs as their intellectual and cultural predecessors and described Toltec culture emanating from Tollan (Nahuatl for Tula) as the epitome of civilization, indeed in the Nahuatl language the word Toltecatl came to take on the meaning "artisan". The Aztec oral and pictographic tradition also described the history of the Toltec empire giving lists of rulers and their exploits. The Maya is one of the longest lived Mesoamerican civilizations. It originated in the Pre-Classic period of archaeological chronology and is represented today by a large surviving population. They flourished from about 250 to 900 AD when most of their majestic cities were constructed, and they were still numerous and strong when the Spanish arrived in the fifteenth century. They occupied parts of present day Chiapas, Tabasco, and the Yucatan Peninsula in Mexico, as well as Guatemala, Belize, and parts of Honduras and El Salvador. They spoke various dialects of the Mayan language, many of which have survive to the present day. Some of their important sites are shown in the attached map. The Maya developed a system of hieroglyphic writing which was unique and which has allowed scholars to decipher much of their ancient history. They also used the Long Count Calendar, which was dated back to 11 August 3114 BC. This calendar was probably originated by the Olmec. From Wikipedia: The Maya is a Mesoamerican civilization, noted for the only known fully developed written language of the pre-Columbian Americas, as well as for its art, architecture, and mathematical and astronomical systems. Initially established during the Pre-Classic period (c. 2000 BC to AD 250) ... many Maya cities reached their highest state of development during the Classic period (c. AD 250 to 900), and continued throughout the Post-Classic period until the arrival of the Spanish. The Maya civilization shares many features with other Mesoamerican civilizations due to the high degree of interaction and cultural diffusion that characterized the region. Advances such as writing, epigraphy and the calendar did not originate with the Maya; however, their civilization fully developed them. Maya influence can be detected from Honduras, Belize, Guatemala, and western El Salvador to as far away as central Mexico, more than 1,000 km (620 mi) from the Maya area. Many outside influences are found in Maya art and architecture, which are thought to result from trade and cultural exchange rather than direct external conquest ... Around 100 AD, there was widespread decline and abandonment of Maya cities - called the Preclassic Collapse. This marked the end of the Preclassic era. It has been suggested that the Huasteca people originally were Maya who were divided from the southern Maya groups when other formative peoples pushed northeastward from the Soconusco region dividing and displacing the original Maya. They were thus split into two groups, the northern Huasteca, and the southern Maya. From Wikipedia: La Huasteca is a cultural region located in the northeast of Mexico, including parts of the states of Tampaulipas, Veracruz, Puebla, Hidalgo, San Luis Potosi, Queretero and Guanajuato. It is roughly defined as the area in which the Huastec people had influence when their civilization was at its height in the Mesoamerican period. Today, the Huastecs occupy only a fraction of this region ... 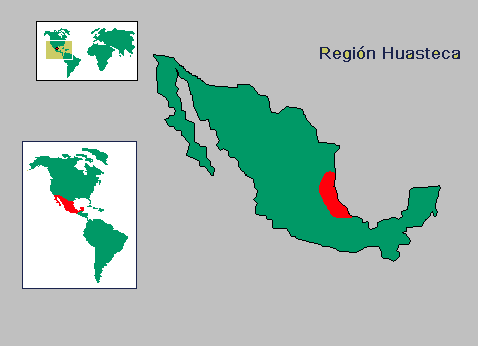 The Huastecs are what probably remain of Mayan expansion northward up the Veracruz coast but were “left behind” after other Mayan groups retreated south and east. 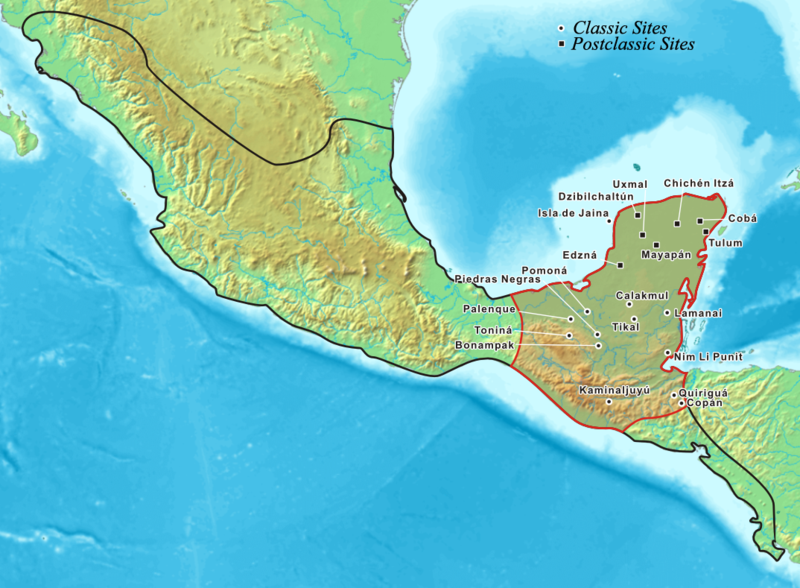 The Huastecs began to be culturally dominant in their region between 750 and 800 CE after El Tajin waned. From then to the 15th century, they expanded their territory and influence from the Tuxpan River to the Pánuco with most settlements along the banks of the Huayalejo-Tamesí River, along the northern Veracruz and southern Tamaulipas coast and west into the Sierra Madre Oriental. The culture was influential even farther west into northern Querétaro, and there may have been Huastec settlements into what is now northern Puebla. Notable settlements include El Tamuin in San Luis Potosí, Yahualica and Huejutla in Hidalgo, Tzicóaxc on the Veracruz/Puebla border as well as Tuxpan, Temapache, Pánuca and Tanhuijo in Veracruz. Teotihuacan is a huge archaeological site north of Mexico City. It has not been established which group of people built and inhabited this city, and we do not know their language or their basic history. They pre-dated the Aztec culture and were dominant in Mesoamerica from about 300 BC to 200 AD. From Wikipedia: Teotihuacan ... is an enormous archaeological site in the Basin of Mexico, 30 miles (48 km) northeast of Mexico City, containing some of the largest Mesoamerican pyramids built in the pre-Columbian Americas. The name means "where man met the gods." Apart from the pyramids, Teotihuacan is also known for its large residential complexes, the Avenue of the Dead, and numerous colorful, well-preserved murals. Additionally, Teotihuacan produced a thin orange pottery style that spread through Mesoamerica. The city is thought to have been established around 100 BC and continued to be built until about 250 AD. The city may have lasted until sometime between the 7th and 8th centuries AD. At its zenith, perhaps in the first half of the 1st millennium AD, Teotihuacan was the largest city in the pre-Columbian Americas, with a population of perhaps 125,000 or more, placing it among the largest cities of the world in this period. 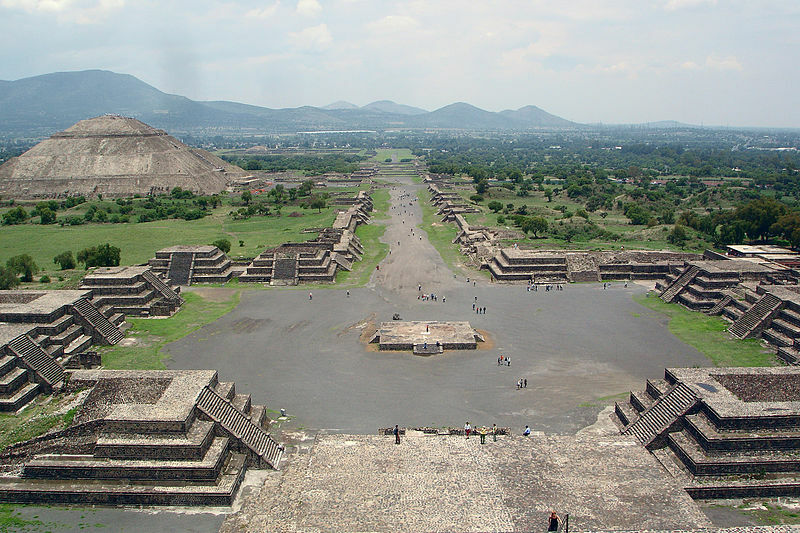 Teotihuacan began as a new religious center in the Mexican Highland around the first century AD. This city came to be the largest and most populated center in the New World. Teotihuacan was even home to multi-floor apartment compounds built to accommodate this large population. Although it is a subject of debate whether Teotihuacan was the center of a state empire, its influence throughout Mesoamerica is well documented; evidence of Teotihuacano presence can be seen at numerous sites in Veracruz and the Maya region. The Aztecs may have been influenced by this city. The ethnicity of the inhabitants of Teotihuacan is also a subject of debate. Possible candidates are the Nahua, Otomi, or Totonac ethnic groups. 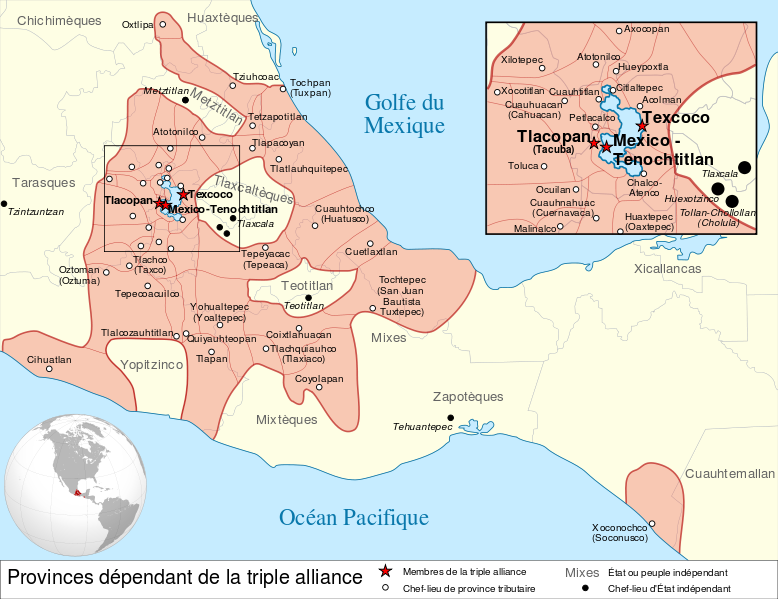 Scholars have also suggested that Teotihuacan was a multiethnic state. We can date the Aztec civilization from the founding of their capitol Tenochtitlan in 1325 at the present day site of Mexico City. 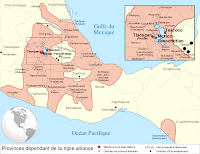 They controlled a large empire covering much of central Mexico until the coming of the Spaniards. Aztec legends specify their origin from the area around the head of the Gulf of California. They spoke the Nahuatl language. From Wikipedia: The Aztec people were ... those groups who spoke the Nahuatl language and who dominated large parts of Mesoamerica from the 14th to the 16th centuries. The Nahuatl words aztecatl and aztecah mean "people from Aztlan" a mythological place for the Nahuatl-speaking culture of the time, and later adopted as the word to define the Mexica people [I do not believe that Aztlan was mythical but referred to the place of origin of the original Jaredites in Sumer. It means "place of the egrets or herons"] ... [The Aztecs together with the Acolhuas and the Tepanecs] formed the Aztec Triple Alliance which controlled ... the "Aztec Empire" ... At its pinnacle, Aztec culture had rich and complex mythological and religious traditions, as well as reaching remarkable architectural and artistic accomplishments. Aztec culture and history is primarily known through archaeological evidence found in excavations such as that of the renowned Templo Mayor in Mexico City; from indigenous bark paper codices; from eyewitness accounts by Spanish conquistadors such as Hernan Cortes and Bernal Diaz del Castillo; and especially from 16th and 17th century descriptions of Aztec culture and history written by Spanish clergymen and literate Aztecs in the Spanish or Nahuatl language, such as the famous Florentine Codex compiled by the Franciscan monk Bernardino de Sahagun with the help of indigenous Aztec informants. The people named Pipil (variously translated as Noble, Childish, or Boy) are a group currently living in El Salvador who originally are thought to have emigrated from Mexico and it has been suggested that they were originally Toltecs. However some dispute this and feel that they were descended from the Maya. They speak a form of Nahuatl which would tend to favor the Toltec theory. Many in El Salvador are mestizos of the original Pipil culture. One of the main products of the Pipil was cacoa which was grown and exported from their region.